Use save5 Coupon at Checkout for 5% Off Most Brands! Save15 Coupon Offers 15% Off All Life Extension Products! Q. How are your prices compared to the Life Extension Annual Super Sale? A. Our sole purpose is to serve you, and we do in a variety of ways. One way is by offering deeper discounts to make your good health as affordable as possible, 365 days a year. That’s why our save15 coupon code provides great year-round savings without requiring the purchase of multiple units to get the best price. Most people use several different products, and purchasing 4 or more of the same product quickly adds up and takes a toll on the wallet. Our approach of offering an additional discount off the total of assorted products results in more savings than the 4 or more bottle minimum requirement in comparison. You get maximum savings all year long with DR Vitamin Solutions! We also offer 5% cash back in Reward Points, and provide Free Economy Domestic Shipping for all orders. In a fair comparison, Life Extension charges $5.50 shipping per order, and charges yearly membership fees of $75 which is required to obtain their discounts. 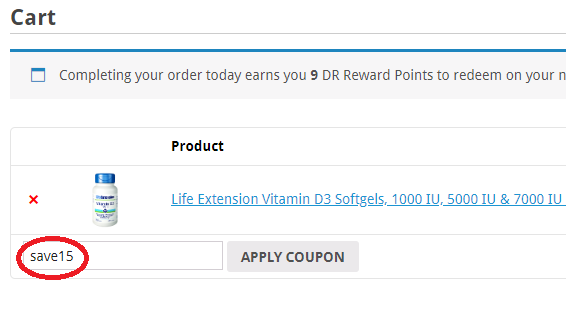 With DR Vitamin Solutions, no account or membership is needed to use the coupons or get member pricing, plus you earn Reward Points that you can redeem on each and every subsequent order. We always do what is best for the customer, and are not just out to sell them as many supplements as possible. You can speak directly to a Holistic Health Consultant that takes a personal interest in your health. 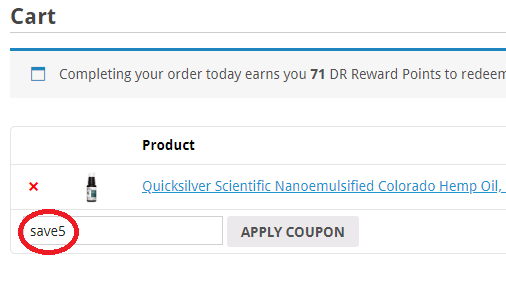 Register for a FREE DR account and automatically receive rewards points whenever you place an order. Earn 5% rewards cash for every dollar spent. For example, if you have a $200.00 order, you will earn $10.00 in rewards points! You can use your free money on your very next order, and still earn more free money on the very same order you are redeeming points on! A never-end cycle of FREE money just for you! To see your points now, log in to your account and look under the Customer Information tab. If you don’t have any points yet, just start shopping! Remember, you need to sign up for a free account to earn DR Reward Points. Earn 10% Reward Points with Hassle Free AutoShip Delivery! AutoShip allows you to get the supplements you need, when you need them. With AutoShip you won’t run out of your supplements or have to remember to place your order. It is easy to set up AutoShip in your shopping cart when you order online, or call 1-888-432-5824 for more info. Our phone lines are open from 9:00 to 5:00 PM EST, Mon thru Fri, excluding federal holidays. The 10% Reward Points on all Auto Ship orders begins with your second shipment. Your credit card will be charged when the items ship, and you can easily cancel at any time. With DR Vitamin Solutions, you never get an unwanted charge. Plus you will receive free economy domestic shipping on all orders!